Governor Okorocha advocated, in the spirit of reconciliation, that the Federal Government should release Nnamdi Kanu. 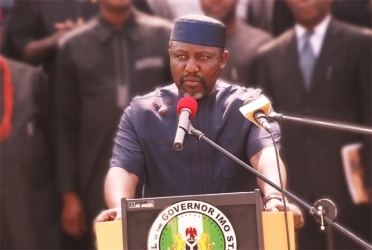 Okorocha opined that his activities should be seen as youthful exuberance. They'll soon know who owns the land. Look at this shameless traitor beast who have sold his birth rights to Buhari. Just hear the nonsense coward is vomiting from his mouth! Okorocha should go to hell!!! Who ask this fool to talk on Biafra issue? Where is this Fool coming from? Is this not the same guy who insulted Biafrans? He knows all along that others are agitating as well? Okoro-aturu or whatever you call yourself. okoro-awusa go and talk to your masters, Ibrahim Babangida, Theophilus Danjuma, Yakubu Gowan, Buhari and Obasanjo Olusegun to stop killing Biafrans. Biafrans don't need you to tell the zoo to release our leader because our leader must be release. Okoro-aturu should be very stupid to say our great leader Maxi Nnamdi Kanu is rude to nigeria rulership. Nigerian rulership deserve something more than insult. They are now all talking: Kalu, Okoroawusa, Obi, and others. By the way, it is a shame that illiterate and tyrant Fulani president has the audacity to detain a young Biafra leader well over a year now for speaking out and seeking self-determination for his people. Meanwhile, Fulani herdsmen are parading with their weapons and massacring people while Boko haram is violently seeking for Islamic State. Today, Boko haram controls about 5 local govt areas in Borno State and the coward Nigeria army is not doing anything. Kanu and other Biafrans in detention by this Fulani president is a big slap on Igbo leaders and elders. What a disgrace to Biafran people. Even Islamic Nigerian puppets in Biafra land are beginning to see where Biafrans stand. Biafran youths are seeing what the future holds for them, and it can only in Biafra land. Kanu destroyed the era of lying and deceit by Nigerian politicians, especially, the dubious ones of Biafran extraction like Okorocha. Biafrans believe completely in the message and mission from Kanu.